Ruby’s Diner Celebrates 35 Years of America’s Favorite Burgers, Fries and Shakes on December 7, 2017! On December 7th, 1982, our founder and CEO, Doug Cavanaugh, opened the doors to the very first Ruby’s Diner. At the end of the Balboa Pier what once was an old bait shop had been transformed into a sparkling diner with authentic antique décor, jivin’ tunes from a past time, and friendly service, Ruby’s Diner was seemingly straight from the 1940’s. The tiny 45-seat restaurant, which was named after Cavanaugh’s mother, Ruby, opened with just three employees and a simple menu of hamburgers, hot dogs, and malts. In its first day, it brought in a whopping $63, but most importantly, smiling guests looking to remember a simpler, happier time. Now, 35 years later, over 35 Ruby’s Diner restaurants can be found in all different parts of the country such as California, Nevada, Texas, and Pennsylvania, including mall, casino, and airport locations. We’re proud to continue our legacy of providing guests with quality service and delicious diner cuisine. Here’s to many more years of Shooby Doobying down to Ruby’s! What’s A Celebration Without A Party? You’re Invited! Join us on December 7th, 2017 to celebrate the 35th Anniversary of Ruby’s Diner with a very special deal! 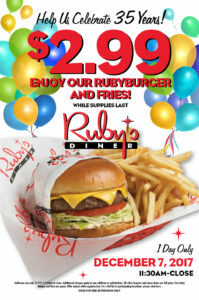 On our milestone date, participating Ruby’s Diner locations will offer our classic RubyBurger with French fries for just $2.99 while supplies last. We are also proud to announce that proceeds from each sale of our classic RubyBurger with French fries on the 35th Anniversary of Ruby’s Diner will directly benefit two organizations near and dear to our hearts: The Ruby Dooby Foundation and Spark of Love. The Ruby Dooby Foundation carries on the legacy of giving and compassion embodied by Ruby Cavanaugh, who adored children. The proceeds from the 35th Anniversary will directly benefit The Ruby Dooby Foundation, with $5,000 of the total donation to be given to Spark of Love, a toy drive and distribution initiative that benefits foster youth and caregivers. Offer valid one day only 12/7/17 11:30am to close. Additional charges apply to any addition or substitution. All other burgers and menu items are full price. One RubyBurger and fries per guest. Offer stands while supplies last. Participating locations may vary.